Traumatic brain injury (TBI) occurs when an external force injures the brain and can be caused by a direct impact or by acceleration alone. Following the initial injury, brain trauma causes secondary events, like changes in cerebral blood flow and intracranial pressure, that contribute to the damage caused by the trauma. Brain injuries can be classified into mild, moderate, and severe categories; the Glasgow Coma Scale (GCS) is the most commonly used system for classifying TBI severity. Symptoms of TBI depend on the severity of the injury, whether the injury is diffuse or focal, and the part of the brain that is affected. A famous case of personality change following TBI is that of Phineas Gage, who survived a construction accident where a large iron rod was driven through the front of his head. Glasgow Coma Scale: (GCS) A neurological scale that aims to give a reliable, objective way of recording the conscious state of a person for initial as well as subsequent assessment. Examples of the causes of TBI include violence, transportation accidents, construction accidents, and sports. Examples of the symptoms of TBI include headache, nausea, dizziness, confusion, and trouble with memory, which can vary depending on the severity of the injury. Common long-term symptoms of moderate to severe TBI are changes in social behavior and cognitive changes, including problems with attention and planning. Traumatic brain injury (TBI), also known as intracranial injury, occurs when an external force traumatically injures the brain. TBI can be classified based on severity, mechanism (closed or penetrating head injury), or other features, such as whether it occurs in a specific location or over a widespread area. Head injury usually refers to TBI, but is a broader category because it can involve damage to structures other than the brain, such as the scalp and skull. TBI is a major cause of death and disability worldwide, especially in children and young adults. Causes include falls, vehicle accidents, and violence. Prevention measures include use of technology to protect those who suffer from automobile accidents, such as seat belts and sports or motorcycle helmets. Efforts to reduce the number of automobile accidents are also implemented, such as safety education programs and enforcement of traffic laws. Brain injuries can be classified into mild, moderate, and severe categories. The Glasgow Coma Scale (GCS), the most commonly used system for classifying TBI severity, grades a person’s level of consciousness on a scale of 3–15 based on verbal, motor, and eye-opening reactions to stimuli. It is generally agreed that a TBI with a GCS of 13 or above is mild, 9–12 is moderate, and 8 or below is severe. 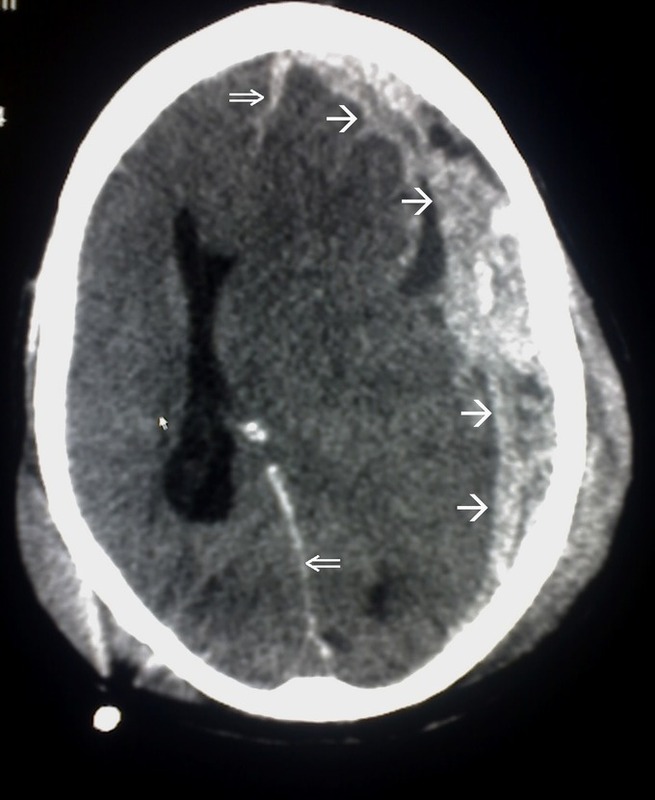 Subdural hematoma is a possible result of traumatic head injury: In this image, the single arrow marks spread of the subdural haematoma and the double arrow marks the midline shift. TBI can cause a host of physical, cognitive, social, emotional, and behavioral effects, and the outcome can range from complete recovery to permanent disability or death. The 20th century saw critical developments in diagnosis and treatment that decreased death rates and improved outcome. Some of the current imaging techniques used for diagnosis and treatment include CT scans (computed tomography) and MRIs (magnetic resonance imaging). Depending on the injury, treatment required may be minimal or may include interventions such as medications, emergency surgery or surgery years later. Physical therapy, speech therapy, recreation therapy, and occupational therapy may be employed for rehabilitation. Complications are distinct medical problems that may arise as a result of the TBI. TBI can cause prolonged or permanent effects on consciousness, such as coma, brain death, persistent vegetative state (in which patients are unable to achieve a state of alertness to interact with their surroundings), and minimally conscious state. Lying still for long periods can cause complications including pressure sores, pneumonia or other infections, progressive multiple organ failure, and deep venous thrombosis, which can cause pulmonary embolism. Complications involving the blood vessels include vasospasm, in which vessels constrict and restrict blood flow, the formation of aneurysms, in which the side of a vessel weakens and balloons out, and stroke. Movement disorders that may develop after TBI include tremor, ataxia (uncoordinated muscle movements), myoclonus (shock-like contractions of muscles), and loss of movement range and control (in particular with a loss of movement repertoire). The risk of post-traumatic seizures increases with severity of trauma and is particularly elevated with certain types of brain trauma such as cerebral contusions or hematomas.